Tony Romo leaves the Cowboys and the NFL today. But even in retirement, we'll see him soon as a TV analyst. And see him - eternally - in the Ring of Honor. No, this isn't even up for debate. No. 9, who announced his intentions to officially retire this morning, is statistically the greatest Cowboys' quarterback of all-time. And despite only two playoff wins and never a sniff of a Super Bowl over 10+ seaons, he'll deservedly reside forever inside AT&T Stadium alongside Roger Staubach, Troy Aikman and Don Meredith. As confounding and frustrating and polarizing as his career was, Romo's path to immortality is likewise peculiar. As in, there are 21 members of the Ring of Honor. 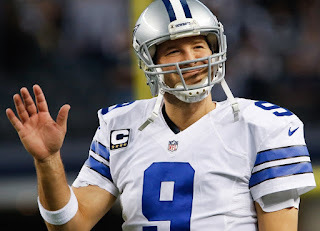 Romo will be only the third - joining Meredith and Don Perkins - with no ties to a championship. But since Meredith got in, Romo's a slam dunk. Dandy Don won exactly one playoff game as Dallas' quarterback in the '60s. He completed only 50% of his career passes, threw for half as many yards as Romo, won merely 47 games and lost consecutive NFL Championship Games to the Packers, including the Ice Bowl. Romo leaves town holding the franchise passing records for yards, touchdowns and career 300-yard games. He has a Top 5 all-time passer rating. A 78-49 record. 4 Pro Bowls. And a legacy as one of the best all-time NFL quarterbacks to never reach a conference championship game, much less a Super Bowl. Romo has his stubborn, irrational critics, but he messed around and had a career that parallels a guy named Y.A. Tittle. In six fewer seasons, in fact, Romo won the same number of games, threw for 1,100 more yards, six more touchdowns and 131 fewer interceptions than the legendary 49ers' and Giants' quarterback. Tittle made three more Pro Bowls than Romo, but never won a single playoff game, going 0-4. Tittle's bust resides in Canton. Romo's helmet is likely headed for Denver, before retiring in glory in Arlington. I didn't exactly have high hopes that night in October 2006 when Bill Parcells yanked Drew Bledsoe in favor of an undrafted, untested Romo. But there's a special place in my heart for him now. Just as there is reserved a spot for him in the Ring of Honor, and on the list of greatest NFL quarterbacks to never achieve great team success. 10. Dave Krieg - 19 seasons, lost only AFC Championship Game in '83. 9. Sonny Jurgensen - Hall-of-Famer never even started a playoff game. 8. Tony Romo - 4 Pro Bowls. Top 5 passer rating. 78 wins. 0 NFC Championship Games. 7. Randall Cunningham - 4 Pro Bowls, lost only NFC Championship Game in '98. 6. Philip Rivers - 5 Pro Bowls, lost only AFC Championship Game in '08. 5. Bernie Kosar - 3 straight AFC Championship Game losses with Browns. 4. John Brodie - '70 NFL MVP went 0-2 in NFC Championship Games. 3. Y.A. Tittle - 32,000 yards. 242 TDs. 7 Pro Bowls. HOF. 0-4 in playoffs. 2. Warren Moon - 9 Pro Bowls. 5 Grey Cups. HOF. 0 AFC Championship Games. 1. Dan Fouts - Hall-of-Famer went 0-2 in AFC Championship Games in '80-81. Richie Whitt is like our own local Sean Spicer. why does he do this? maybe, he has got a better proposition, who knows, the time will show us!